What to do when big winds change the shoreline. How fast is too fast? Properly trimming your boat.. Jack plates vs. dolphin tails and finding the "sweet spot." Nearshore fishing tips and musts. Finding the right soft plastic bait for you. The "Hit Zone." What to do when big winds change the shoreline. How fast is too fast? Properly trimming your boat.. Jack plates vs. dolphin tails and finding the "sweet spot." Nearshore fishing tips and musts. Finding the right soft plastic bait for you. Your bait and the "hit zone"
Bite Me - A Texas Saltwater Fishing Podcast: When stuck on the water in a storm dos and don'ts. Old-school navigation/fishing techniques that still work. Why you miss hookups? Getting into polings skiffs and sightcasting. Swivel or no swivel? And more! Are there really "hot spots" in a bay? Rod building the way to go? Best search baits when the bite gets tough. Spring flounder tactics and plan of attack Matching popping cork styles w/ targeted fish. Guide to sight fishing. Capt. Scott's Boat Ramp Confessional. 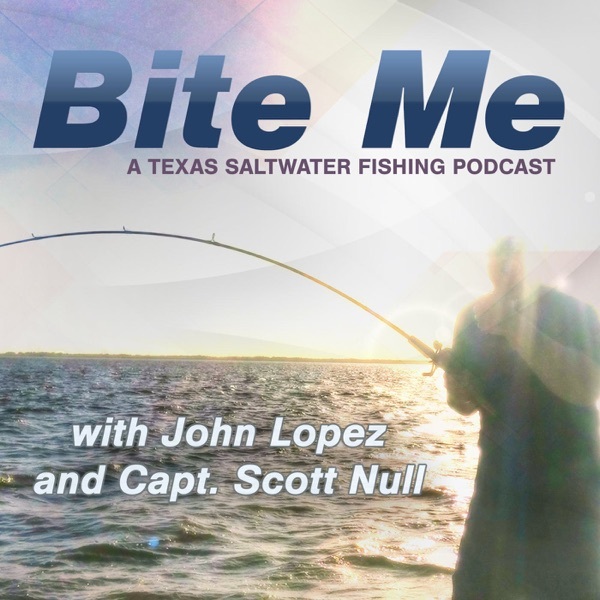 Bite Me - A Texas Saltwater Fishing Podcast: TPWD get it right - Maximizing feeding periods - Oft-forgotten must-haves on your boat - Are drift socks necessary? - Rigging live shrimp and keeping them alive longer - That shrimp may be illegal - Stringers v. net baskets - Navigating apps, websites, charts and GPS. Bite Me – A Texas Saltwater Fishing Podcast: What fishing show patrons said about 5-fish trout limits. Kayaking surge, other trends. Spring transition. How to use Google maps, satellite imaging, even drones as tools, and more! Bite Me – A Texas Saltwater Fishing Podcast #26: What fishing show patrons said about 5-fish trout limits. Kayaking surge, other trends in the industry you noticed. Spring transition. How to use Google maps, satellite imaging, even drones as tools. You may be making a big mistake cleaning your reels. Gafftop kill in POC. Bite Me – A Texas Saltwater Fishing Podcast: Fishing show strategies: Finding the right guide, best deals, and fitting equipment. Post cold-front gameplans. Pros and cons (and cons and cons) of airboats. Easy tips: fishing etiquette and more! Bite Me – A Texas Saltwater Fishing Podcast #25: Fishing show strategies: Finding the right guide, best deals, and fitting equipment. Post cold-front gameplans. Pros and cons (and cons and cons) of airboats. Easy tips: fishing etiquette around waders and other fishermen. Making the most of TPWD and other fishing reports. Win tickets to the fishing show. Finding fish despite rain & runoff, the effects of 5-fish limits, a trick to topwaters, navigating, fishing unfamiliar bays, dirty water secrets, and boat ramp confessional - a trailer goes deep. Episode 24: Finding fish despite rain & runoff, the effects of 5-fish limits, a trick to topwaters, navigating, fishing unfamiliar bays, dirty water secrets, and boat ramp confessional - a trailer goes deep. Bite Me – A Texas Saltwater Fishing Podcast: Here comes spring ... what to look for and best approach. Preparing and fishing unpredictable winds. Why wade fishing? Strategies, advice and techniques. The essentials for crab trap cleanup, and more! Here comes spring ... what to look for and best approach. Preparing and fishing unpredictable winds. Why wade fishing? Strategies, advice and techniques. The essentials for fishermen re. crab trap cleanup. How do you know when to switch baits? Fighting trout is just different. Bite Me – A Texas Saltwater Fishing Podcast: Beachfront, nearshore and offshore techniques. Overthinking offshore tackle? Targeting seasons and trends vs. spots. What makes winter trout fishing unique. A chat with Peter Miller. Bite Me – A Texas Saltwater Fishing Podcast #21: Beachfront, nearshore and offshore techniques. Overthinking offshore tackle? Targeting seasons and trends vs. spots. What makes winter trout fishing unique. A chat with Peter Miller. Null, it offers the best in Texas inshore and offshore insight. What the Super Blood Wolf Moon did for fishing patterns? Did TPWD "fish wars" not go far enough? Seagrass and other habitat solutions. What folks who launch a boat alone should know. Targeting bull reds - a whole different ballgame. Bite Me - A Texas Saltwater Fishing Podcast: Craziest thing we ever caught. Proper way to free-line bait. Including offshore. Pairing a new outboard with a new boat. Proper motor care schedule. High tech trends in casting reels and more! Bite Me - A Texas Saltwater Fishing Podcast #19: Craziest thing we ever caught. Proper way to free-line bait. Including offshore. Pairing a new outboard with a new boat. Proper motor care schedule. High tech trends in casting reels. Pros and cons of spinning reels. Bite Me - A Texas Saltwater Fishing Podcast #18: It's big trout time... "Jumping" on the opportunity. Boat show vessel innovations. Craziest true fish stories near shore. Bite Me - A Texas Saltwater Fishing Podcast: Tips shopping the Boat Show, what you can learn from "the hunt," the sounds you hear on the water matter, and what to learn from how bait works. Also, should we be loyal to one body of water? And more! -- What you can learn from "the hunt"
-- Should we be loyal to one body of water? -- How to approach bad when it's the only day you can fish. Bite Me - A Texas Saltwater Fishing Podcast - - What TPWD wants to know re. Snapper season. - "Using electronics" ... what exactly to look for. - What do redfish do differently this time of year? - Why does it seem fish disappear all of a sudden? - What TPWD wants to know re. Snapper season. - "Using electronics" ... what exactly to look for. - What do redfish do differently this time of year? - Why does it seem fish disappear all of a sudden? - How embracing "the hunt" pays off. - Our favorite tournament stories. Bite Me - A Texas Saltwater Fishing Podcast #15: Essential gear every angler needs, Fishing deeper cuts in cold weather, Are overcast days really better? What hull is best for you? How to keep bait alive longer. Boat ramp confessional and ones that got away because of user error. Bite Me - A Texas Saltwater Fishing Podcast #14: How do fish, "think"? Winter trout behaviors and tactics. Best bait when fishing with kids. What a five-trout limit up and down the coast means. What can fishermen do for habitat? This weekend's prospects after heavy winds. Bite Me - A Texas Saltwater Fishing Podcast: Guides vs. owning a boat, things to do and know between trips, what boat is the right boat? Shoreline, "tells" absent of bait, what about wellheads? Digging deep on the FTU Inshore Expo. Bite Me - A Texas Saltwater Fishing Podcast #13: Guides vs. owning a boat, things to do and know between trips, what boat is the right boat? Shoreline, "tells" absent of bait, what about wellheads? Digging deep on the FTU Inshore Expo. Bite Me - A Texas Saltwater Fishing Podcast: Do Solunar tables really work? Also post-full moon a no-go? How to break a slump. Maximizing odds on crowded weekends. Best ways to introduce kids and newcomers. Boat ramp confessional. Bite Me - A Texas Saltwater Fishing Podcast #12: Do Solunar tables really work? Also post-full moon a no-go? How to break a slump. Maximizing odds on crowded weekends. Best ways to introduce kids and newcomers. Boat ramp confessional. Bite Me - A Texas Saltwater Fishing Podcast: Rod care, line strength, leaders, what to use & when. Boat ramp etiquette. Musts when fall/winter turns nasty. How to handle water & conditions.How long after a front is best and more! Bite Me - A Texas Saltwater Fishing Podcast #11: Rod care, line strength, leaders, what to use & when. Boat ramp etiquette. Musts when fall/winter turns nasty. How to handle water & conditions.How long after a front is best and more! Bite Me - A Texas Saltwater Fishing Podcast - Mine the bulkheads and rocks this weekend, here's why. Match the hatch. What exactly does it mean? How much noise is too much noise? The must-dos in selecting a rod. Flexibility, style, backbone. Bite Me - A Texas Saltwater Fishing Podcast #10 - Mine the bulkheads and rocks this weekend, here's why. Match the hatch. What exactly does it mean? How much noise is too much noise? The must-dos in selecting a rod. Flexibility, style, backbone. Bite Me – A Texas Saltwater Fishing Podcast - How cold weather changes approach. What autumn means to bait selection. What depth is the right depth? Don't forget egrets! And what terns, seagulls and pelicans really tell us. Your one cast? Bite Me – A Texas Saltwater Fishing Podcast #9 - How cold weather changes approach. What autumn means to bait selection. What depth is the right depth? Don't forget egrets! And what terns, seagulls and pelicans really tell us. Your one cast? Bite Me – A Texas Saltwater Fishing Podcast - Offshore tips for bay fishermen. Sunglasses: Best lenses? "Where'd you catch those" guy. Beginner fly fishing. Slow sinking bait. Scouting water. Secret to a good day? Pork rinds and Snickers. Bite Me – A Texas Saltwater Fishing Podcast #8 - Offshore tips for bay fishermen. Sunglasses: Best lenses? "Where'd you catch those" guy. Beginner fly fishing. Slow sinking bait. Scouting water. Secret to a good day? Pork rinds and Snickers. Bite Me – A Texas Saltwater Fishing Podcast - Short rigs in bay boats - specific strategies? Wind slicks - Worth trying? Best strategy to fish an island/exposed reef. Where and how to start at jetties. Mangrove snapper techniques and more! Bite Me – A Texas Saltwater Fishing Podcast #6 - Short rigs in bay boats - specific strategies? Wind slicks - Worth trying? The best strategy to fish an island/exposed reef. Where and how to start at jetties. Mangrove snapper techniques and more! Bite Me – A Texas Saltwater Fishing Podcast - The Ones That DID NOT get away. Fish stories from the CCA STAR Tournament Banquet. Plus, how you can impact Bite Me topics. Bite Me – A Texas Saltwater Fishing Podcast #5 - The Ones That DID NOT get away. Fish stories from the CCA STAR Tournament Banquet. Plus, how you can impact Bite Me topics. Bite Me – A Texas Saltwater Fishing Podcast - How rainfall and how salinity levels affect redfish. What about bait soakers, rock walkers and surf fishermen? Tips for jetty, pier and bank fishing. 30-inch snook in Texas. Where to try this weekend? Bite Me – A Texas Saltwater Fishing Podcast #4 - How rainfall and how salinity levels affect redfish. What about bait soakers, rock walkers, and surf fishermen? Tips for jetty, pier and bank fishing. 30-inch snook in Texas. It's happening! When to go before and after cool fronts and dropping pressure vs. rising pressure. Where to try this weekend? Bite Me – A Texas Saltwater Fishing Podcast - What did Hurricane Harvey do to the bay systems, structure, and habitat. Is that trout population truly in trouble? Three techniques for working soft plastic and when/how to use them, and more. Bite Me – A Texas Saltwater Fishing Podcast #3 - What did Hurricane Harvey do to the bay systems, structure, and habitat. Is that trout population truly in trouble? Three techniques for working soft plastic and when/how to use them, and more. Bite Me – A Texas Saltwater Fishing Podcast - Factors that lead to catching BIG trout, kayak fishing, how to balance a confidence bait, tides, and where to fish this weekend. Bite Me – A Texas Saltwater Fishing Podcast #2 - Factors that lead to catching BIG trout, kayak fishing, how to balance a confidence bait, tides, and where to fish this weekend. Episode 1: Talking Texas tarpon, controversial croaker fishing, and how to fish a slick, and sight-casting reds with flies and casting rods. Plus, the Boat Ramp Confessional.